In March 2010, I contributed to an article in the Sunday Times entitled “SAS veterans join new war on poachers” which sparked a global debate on the role of wildlife charities in deploying specialist military advisors to support armed rangers, who are putting their lives on the line to protect elephants in Africa from a surge in poaching. 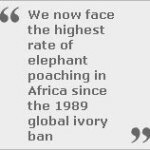 The article was aimed at drawing global attention to the surging demand for ivory in China, Thailand and Vietnam and its devastating impact on Africa’s remaining elephants and ahead of key discussions on the ivory trade at the Convention on International Trade in Endangered Species (CITES) in Doha. Following the Doha CITES conference in 2010, all the African nations with elephant populations agreed an African Elephant Action Plan. This unique initiative would for the first time see full co-operation between elephant states in order to help stop the illegal killing of elephants and trade in their products. Over three years later and following another CITES conference in Thailand, only $300,000 has been pledged by the international community to fund the $98 million budget for the Elephant Action Plan and it remains on hold. This is despite the fact that we now face the highest rate of elephant poaching in Africa since the global ivory ban was introduced in 1989. In 2012 alone it was estimated that 40,000 elephants were killed by poachers, or one every 15 minutes. In the early 1900’s the elephant herds of Africa exceeded 12 million, today only 3% of the population remain around 350,000 elephants and if the current level of poaching continues, most of these animals could be lost in the next decade. However, with significant media coverage and growing recognition from the international community on the threat of elephant poaching to global security, we are now beginning to see the rich nations of the world wake up to the need to provide significant financial support to African Nation’s or NGO’s to protect what is left of Africa’s Elephants. The fight to save Africa’s elephants received a major boost at the recent G8 Summit in Northern Ireland, when following a campaign of media and lobbying activities by Care for the Wild and Born Free with the support of Zac Goldsmith MP, G8 leaders for the first time recognized the need to tackle criminal trafficking and strengthen border security to prevent wildlife crime, in the final summit declaration. Hot on the heels of the G8 summit, President Obama signed a new Executive Order during his trip to Tanzania to establish a Presidential Task Force on Wildlife Trafficking. This will open the door to over $10 million in training and technical assistance in Africa to combat wildlife crime including elephant poaching. The UK Government is also now exploring how it can do more to take a leading role in combating elephant and rhino poaching in Africa, possibly via linking humanitarian aid and wildlife protection through its international development programmes. US Secretary of State John Kerry opened US Senate hearing on elephant poaching in Washington last year by saying “How shockingly destructive and historically shameful it would be if we did nothing while a great species was criminally slaughtered into extinction”. Let’s hope that the international community is now finally waking up to this reality and will act decisively to protect what is left of Africa’s elephants before it’s too late.